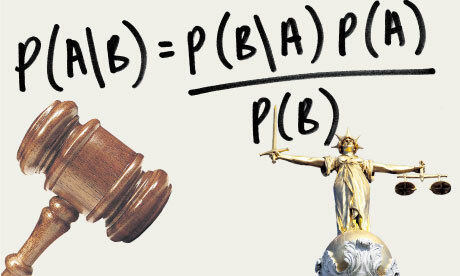 Bayes' theorem is a mathematical equation used in court cases to analyse statistical evidence. But a judge has ruled it can no longer be used. Will it result in more miscarriages of justice? It's not often that the quiet world of mathematics is rocked by a murder case. But last summer saw a trial that sent academics into a tailspin, and has since swollen into a fevered clash between science and the law. At its heart, this is a story about chance. And it begins with a convicted killer, "T", who took his case to the court of appeal in 2010. Among the evidence against him was a shoeprint from a pair of Nike trainers, which seemed to match a pair found at his home. While appeals often unmask shaky evidence, this was different. This time, a mathematical formula was thrown out of court. The footwear expert made what the judge believed were poor calculations about the likelihood of the match, compounded by a bad explanation of how he reached his opinion. The conviction was quashed. But more importantly, as far as mathematicians are concerned, the judge also ruled against using similar statistical analysis in the courts in future. It's not the first time that judges have shown hostility to using formulae. But the real worry, say forensic experts, is that the ruling could lead to miscarriages of justice. "The impact will be quite shattering," says Professor Norman Fenton, a mathematician at Queen Mary, University of London. In the last four years he has been an expert witness in six cases, including the 2007 trial of Levi Bellfield for the murders of Marsha McDonnell an.... He claims that the decision in the shoeprint case threatens to damage trials now coming to court because experts like him can no longer use the maths they need. Specifically, he means a statistical tool called Bayes' theorem. Invented by an 18th-century English mathematician, Thomas Bayes, this calculates the odds of one event happening given the odds of other related events. Some mathematicians refer to it simply as logical thinking, because Bayesian reasoning is something we do naturally. If a husband tells his wife he didn't eat the leftover cake in the fridge, but she spots chocolate on his face, her estimate of his guilt goes up. But when lots of factors are involved, a Bayesian calculation is a more precise way for forensic scientists to measure the shift in guilt or innocence. In the shoeprint murder case, for example, it meant figuring out the chance that the print at the crime scene came from the same pair of Nike trainers as those found at the suspect's house, given how common those kinds of shoes are, the size of the shoe, how the sole had been worn down and any damage to it. Between 1996 and 2006, for example, Nike distributed 786,000 pairs of trainers. This might suggest a match doesn't mean very much. But if you take into account that there are 1,200 different sole patterns of Nike trainers and around 42 million pairs of sports shoes sold every year, a matching pair becomes more significant. The data needed to run these kinds of calculations, though, isn't always available. And this is where the expert in this case came under fire. The judge complained that he couldn't say exactly how many of one particular type of Nike trainer there are in the country. National sales figures for sports shoes are just rough estimates. The popular press's coverage of this case left many of us under the impression that Bayes theorem itself was under attack within the legal system. Fortunately, it turns out the ruling was a completely sensible rejection of how the calculation was done, not a rejection of statistical theory or the application of statistical theory in law. Cosma Shalizi breaks down the story for statisticians in detail here: http://cscs.umich.edu/~crshalizi/weblog/821.html. It's a great read if you're interested in this sort of thing.